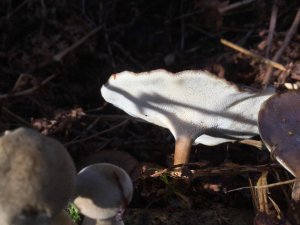 Observation - Winter Polypore - UK and Ireland. Description: About ten (frosted) polyporous mushrooms growing on a dead log and partially covered by leaf litter. About ten (frosted) polyporous mushrooms growing on a dead log and partially covered by leaf litter. Dark brown cap app 7cm diameter on a relatively short pale stipe. White underside.